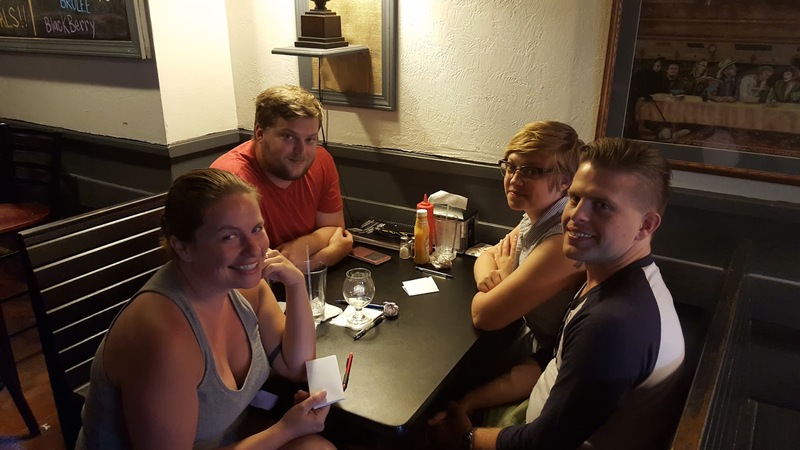 Brandon was back for another great round of trivia after a weekend off. We had a strong start for a couple of teams with several teams coming in at 9 for the first round. Our Famous Doctors round was meet with cheers, but not the scores to back it up. I think our crowd was hoping for a Dr. Who round and not famous Doctors. We will know for next time. The picture round saw an increase in scores with a lot of teams getting close to a perfect score. Our "Pen" is Mightier round was a crowd favorite. If you have never seen the SNL clip, I would highly recommend it. Funny TV, PG, but funny. Our "G" ology round was great. It is amazing how many of the answers looked the exact same in our contestants handwriting! We had an extremely close game going into our last round with most of our teams being within 10 points of each other. Sadly, the last round was a rough round with the high score being a 25. After all the questions were answered and all the score tabulated it was Forever Alone & Friends back at the top of the leaderboard.